At last...making art full-time: Etching and aquatint, "Fort Benning 1950"
Etching and aquatint, "Fort Benning 1950"
Where in the world have I been for the past month? Well, I was in northern California, and no, it wasn't for a vacation. Jim, Mathew and I took on the monumental task of sorting, packing and cleaning out my parent's home in order to put it up for sale. It was a bittersweet experience, coming across so many things from my childhood. The hardest part was the paper trail my father left, which showed his organization and need for order gradually disintegrate as he battled to hang on to his independence as Alzheimer's took over. 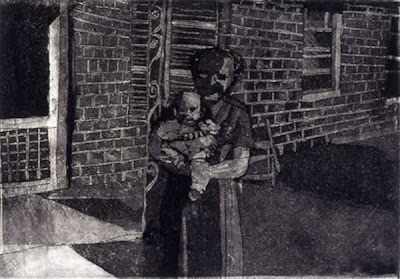 The image you see is an etching/aquatint. I love making prints. It is such a different process from painting. This particular print is from a snapshot of my mom and me in Fort Benning, Georgia. Like all families, I have boxes and albums of photos of my own children and some from my childhood. Now I have boxes and boxes and boxes and more albums from my parents' lives. At some point, I'm guessing some of this imagery will become a part of my work. In the meantime, I'm going to need to figure out where in the world to store it all safely.